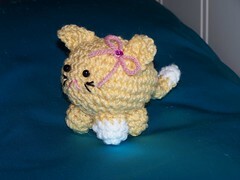 This is my attempt at making a ‘weebbles wobble but they don’t fall down’ type of ami kitty. She turned out pretty cute….not quite as rolly as I wanted, but cute enough to keep! The pattern is here .